Have you tried using Google Maps in your ESL classroom? 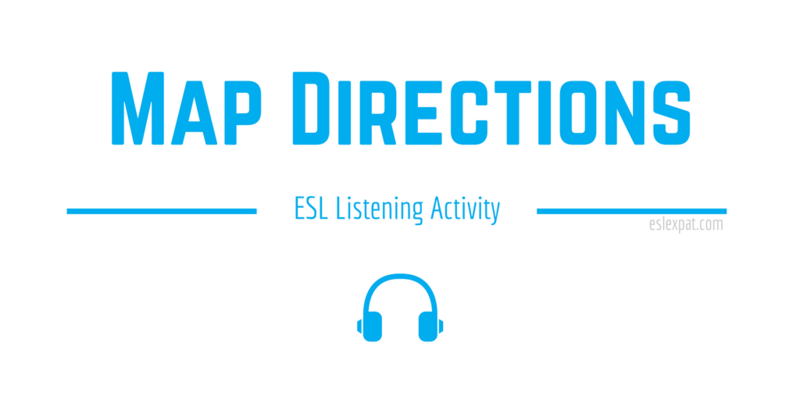 By using this Map Directions ESL Activity, you can improve your students listening skills and get them to practice telling directions. The activity is appropriate for all levels and age groups. To do this activity, you need to have access to Google Maps in your classroom. Students can use their smartphones and tablets or you can use a large screen for the entire class to watch. You may also want to prepare a demo for telling directions on Google Maps. For instance, you could think of how you would tell students to get somewhere in your hometown. Load it on the map and show it on a screen for all the students to see. To begin the lesson, discuss how students get home from school. You could model and example for the class. Describe the directions that you take to get to class from your home. Give basic directions and the streets that you take to get to your final destination. Also, it would be helpful if you drew a rough map on the board with the streets and locations. Then, use a marker as you narrate your way towards the school from your home. Next, load up Google Maps on your classroom screen or tablet. This time, you could reference the actual locations using a combination of the 2-D Google Map and a 3-D version using Google Streetview. Again, navigate your way using appropriate direction vocabulary. It may help to board some basic directions so the students can refer to it when they do the activity themselves with their partners. After completing the modeling tasks, pick another location. It could be in the same city or in another country. Pick somewhere famous to spark students’ interests. Pick either the 2-D version or the 3-D street view version depending on your preference. The 2-D version may be easier for the class to understand and follow. However, you could alternate between the two views or use them in combination. Do whatever works best in your context. With everyone watching the map, ask a student volunteer to describe how to get from one point on the map to another. The student then explains where to go while you move the mouse pointer on the 2-D map. If you are using the 3-D Google Streetview version, you can actually move almost as you would in real time. Correct any errors in the description or in pronunciation. If there is time, ask another student to volunteer. You can then explain to him or her how to get to another location on the map. Finally, the students should have a clear understanding of the activity and what to do. Put the students in pairs and they can perform the same tasks with their partners. Encourage them to use the correct vocabulary and practice navigating to different locations on the map. Monitor their progress as they talk with their partners for a set time limit. At the end, lead feedback and ask a few students to describe how they got to a few of the locations.